Yesterday while driving home from participating in my first ‘Free Model Guild’ meeting, I was reminiscing about what a great time we’d all had. We’d taken turns observing each other closely, doing what we could to capture the likeness/essence of the model, then filter what we saw through our fingertips to our pencils and down on paper. We had 20 minutes. No time for distractions. No music, no talking, no humming, just looking and drawing and the occasional sound of scrubbing erasers…time flew, we were in our zones, in ‘the moment.’ Then we were snapped back into reality when the time-keeper would grate out in her New York accent, t-h-i-r-t-e-e-n m-i-n-u-t-e-s, t-e-n s-e-c-o-n-d-s…(quiet, back to drawing)…s-e-v-e-n m-i-n-u-t-e-s, f-o-r-t-y t-h-r-e-e s-e-c-o-n-d-s…(quiet, back to drawing)…well, you get the picture. I was surprised at how quickly my focus would go from enjoying ‘the moment’ to thinking about the tone and volume of her voice, the accent, how long it took to deliver her words, and why can’t she just round the numbers?…I was distracted, not to mention rude for mentally judging her voice. I thought of that this morning as I was reading about how difficult it is to concentrate on God, our ‘model’ so to speak. Often it’s the blessings in our life and the maintaining of them that distract, or possibly it’s looking at other Christians, what they do or don’t do that grates on us. We get caught up in comparing. Then, a waft of trouble comes our way, sometimes it’s a whole bucket full, we allow ourselves to gorge on it. Then we hear that still small voice, ‘Look to Me.’ In essence, put your blinders on, sit down, ignore everything else–stay focused. It’s that simple and that hard. 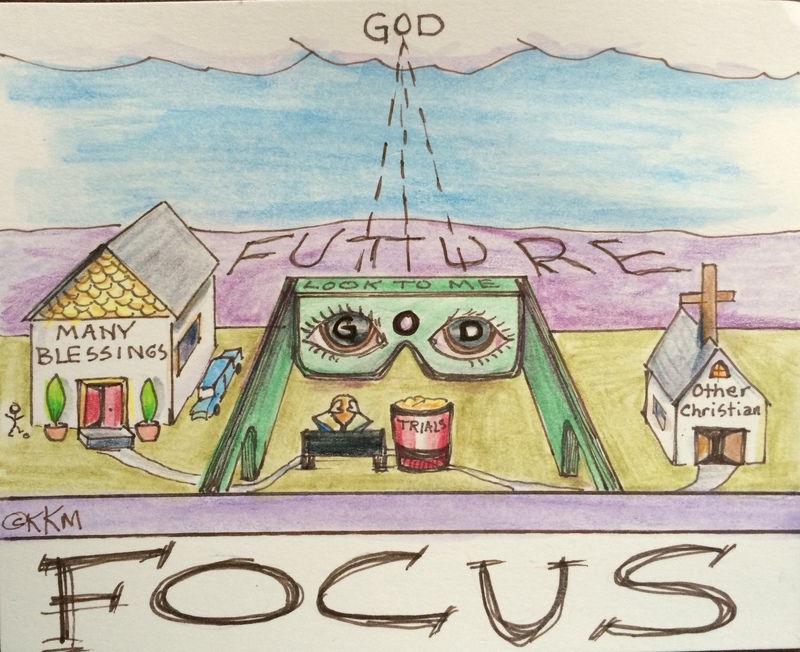 The lesson I learned and tried to portray in this mornings doodle response is this–keep everything in perspective, filter your experiences through God’s eyes and the things of this earth will disappear. Best of all, we’ll learn to portray His essence and image, effortlessly, through the sketches of our life story.